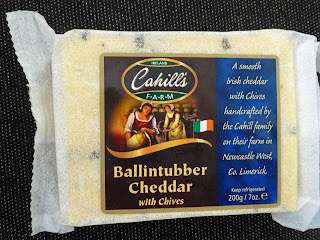 This traditional West Limerick cheese has been handcrafted on Cahill’s Farm . 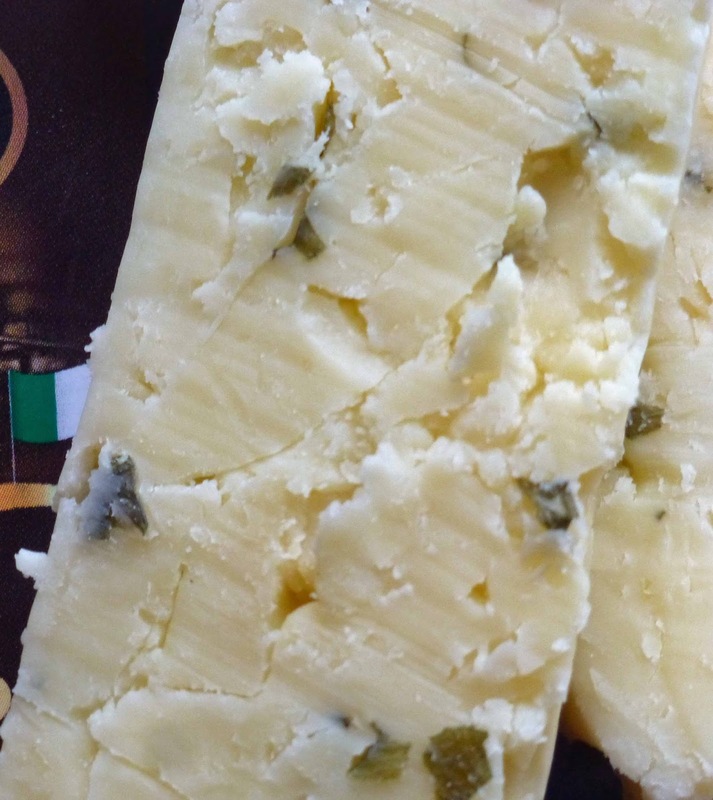 It is wonderfully creamy and the chives give it a soft little crunch. 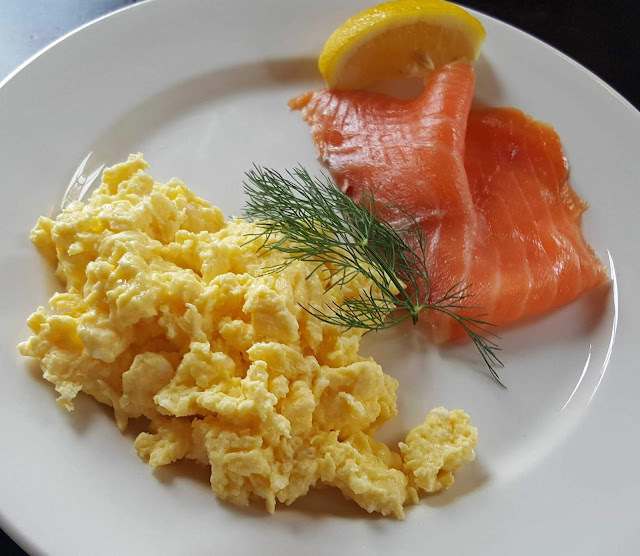 It is an international gold medal winner* and our Taste of the Week. I like producers who provide the consumer with hints and recipes and Cahill’s do just that on the back of the packet. They suggest grating it onto a pizza “for a gourmet twist”. They even suggest a wine: a spicy Syrah/Shiraz. Ideal they say for any cheese board - serve at room temperature with honey or red grapes. I didn't have red grapes handy but the cheese, purchased at Dunne's Stores in Ballyvolane, sure went very well with the excellent Lisanley honey that you can buy at Bradley’s, North Main Street. And it also matched well with a wee drizzle of Highbank Orchard Syrup. So there you go, plenty of ways to try the Taste of the Week. * In 2014, it took gold at the International Cheese Festival which is held annually in Nantwich, England. Great to see newcomers Glenilen Farm (left) at the Mahon Point Farmer’s Market this morning, even if their fantastic cheesecake wasn't on display. Had to settle for their Panacotta at the very reasonable price of 4 euro for two pots! There were a couple of farmers showing off their vegetables, just out of the ground. This time it was the turn of Ballintubber (below). Their cauliflower just cried out for a home. Dan Aherne, another East Cork producer was next door. Their fillet steaks were gone – “they go first” – but there was considerable consolation as I helped myself to a couple of T-bones. Martin Conroy of Woodside contributes to the new 12 mile menu at Midleton’s Sage Restaurant and tells me he is delighted with it. “It was packed last night.” Woodside have quite a range of products from their free range pigs and, among other things, we like his burgers. Also called to Iain O’Flynn; this time we were concentrating on his soups. He had two new to me so we gave them a go: Courgette and Parmesan and also Pea and Mint. Also visited Gubbeen, Arbutus Bread, Rose Cottage, Green Saffron and the Old Millbank Smokehouse and more. By then, the bags were full, the arms at full stretch, so off home to plan the next few meals. With this kind of produce, they should be good.